Take a pinch of brilliant characters. Stir in some snappy dialogue and a helping of high-octane plot. Blend with a fantastically spooky location and serve hot. 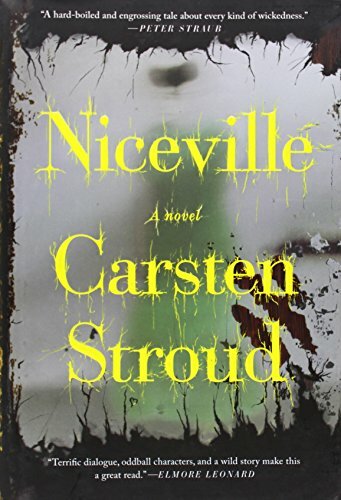 Carsten Stroud’s bouillabaisse of a new novel is a simmering read; one part thriller, one part suspense, and taken with a hefty sprinkling of supernatural hot spice, it’s one of the most compulsive page-turners of the year. Niceville is a book defying easy definition. It isn’t wholly a horror, though “maybe it’s a ghost story.” And it isn’t wholly crime either, although much of the narrative thrust at the start of the book revolves around the disappearance of a child, and then moves on to a bank heist gone wrong, at around about the quarter mark. With everything going on, perhaps the most remarkable thing about Mr. Stroud’s achievement here is the fact he manages to keep control of all of the constituent parts and collected crimes and still manages to pull the whole thing together without it turning into stodge. The fiery pepper of the hard-boiled bank heist never spoils our tastebuds for the spookier small town stuff that actually reads a lot like a Stephen King masterpiece, think: It or The Stand. The end result is as satisfying a genre fiction read as you’re likely to experience in 2012. The hunt for Rainey is headed-up by the book’s protagonist, Special Forces veteran Nick Kavanaugh, a Niceville outsider who now works for the local police force. And though Nick has come face to face with darkness in his previous career, nothing has truly prepared him for the shadowy, nightmare world that he must confront in order to find the truth about the town which he now calls home. But simple facts do not wholly explain the strange feelings the town inspires in the characters, be they “insiders” or “outsiders.” “Niceville has a strange pulse,” says one. Or “the humid warmth of spring gave the whole town the earthy aroma of a freshly dug grave,” as another claims. There is a suggestion that Crater Sink is cursed. That it is the portal through which the evil passes. In no small way, it recalls the rabbit hole in Alice in Wonderland. In the aftermath of her son’s disappearance, Sylvia Teague disappears also, and is thought to have thrown herself into the abyss. But this hole, this portal, works both ways, and also breathes the dank evil into the town, too. It infects everyday people, changing their behaviors. “It’s just that, this job, killing those cops, you get right down to it, it was sorta out of character for us.” There is a sense that the heist and the disappearances wouldn’t be happening anywhere else but the locus around Crater Sink. It’s Crater Sink which rots the inhabitants of the town from within, and pretty much every character seems as much “haunted by history” as the town itself. Nick, for example, has unresolved issues centering around his involvement in an incident in the Middle East which was so serious he was given early retirement from the Special Forces. There’s an awful lot of hatred brewing in Niceville. But there’s also the supernatural going’s on. Like Rainey’s disappearance. Like the problem with mirrors. Mirrors play a crucial role in the story, recalling another Lewis Carroll work, Through the Looking Glass. Rainey Teague disappears after staring into an antique mirror in the shop window. And at a second crime scene later in the book, mirrors provide strange visions of another world beyond ours. This strange, liminal world the mirrors present recalls The Black House, cowritten by Stephen King and Peter Straub. They’re a way of seeing the truth of the town and the purgatorial darkness that shrouds it.